To quote Buzz Lightyear, “QE to infinity and beyond!” Ok, Buzz really didn’t say anything about QE, however Ben’s comments last week regarding the beginning of a new QE program essentially said that easy monetary policy would be from now on, until such time, that the Fed believes it should be revoked. The open-ended nature of the QE lit a fire under commodity prices and stocks within the commodity sector. Treasury bonds took it on the chin as the Fed focus is now on mortgage backed securities. While the expectation is that stocks will outperform bonds over the coming months, it just might be possible that bonds best stocks. When expectations are so high by so many, it makes sense to begin looking at the flipside of the argument to see if there are opportunities that no one is focused upon. Below is a chart showing the relative performance between stocks and bonds (SP500 v. Barclay’s Aggregate) over the past few years. A rising line is bonds besting stocks, falling means stocks beating bonds. Beginning with the peak in bonds vs. stocks (at the market bottom in March ’09) stocks have generally performed better than bonds. There have been relatively short periods of 3-6 months where bonds best stocks. These periods corresponded to additional financial crises, from the US downgrade to sovereign debt in Europe. What is evident from looking at the chart is that each subsequent “worry” about Europe is less stressful for investors, keeping investors buying stocks and avoiding the rush into bonds. The recent decision by the Fed to have QE “unlimited” is the last straw and investors stampeded into stocks after the announcement. The airwaves have been full of pundits worried about Weimar Republic type inflation of 100%+, or concerns about the repercussions of Fed tightening or when they actually have to finally take the punch bowl away from this party. 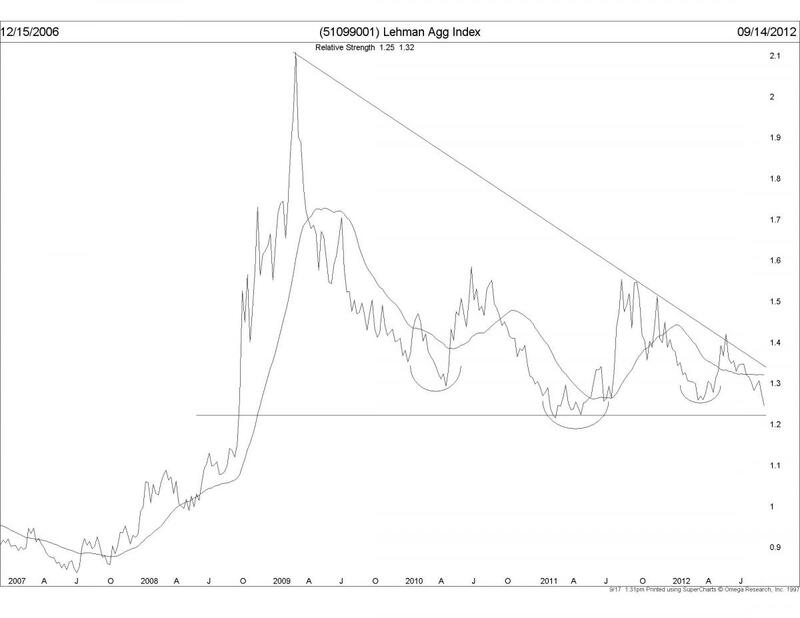 At some point rates will have to go up, but that is not likely to happen for quite some time. What maybe missing from the analysis is the credibility of the central banks around the world. Unlike prior QE, this one is open ended, both in time and money. If the markets find themselves in roughly the same place (or lower) six months from now, then investors will be in a very rough spot. The question on the table today is not what will happen when QE ends, but does the Fed have anything left to throw at the market if the economy does not respond to the current round of easing. The risk of “pushing on a string” is very real at this point. 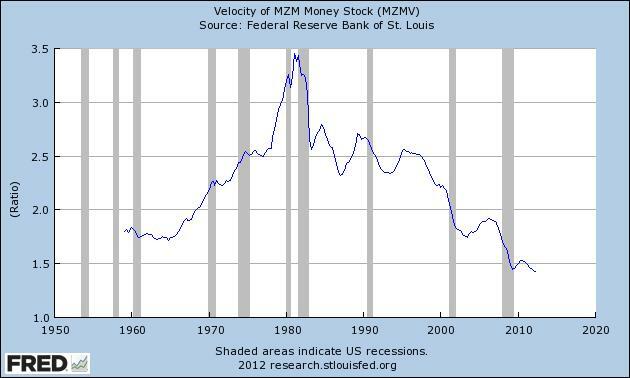 The chart above and the one looking at the Velocity of M2 are both falling rather rapidly, meaning that the frequency of turnover of money or how quickly money goes through the financial system is at extremely low levels. Until we begin to see a pickup in the velocity of money, inflation is likely to remain on the back burner and economic activity will also be slow. By essentially moving “all in” the Fed is putting the credibility of the institution on the table as well. Failure to achieve success in cutting employment and removing the excess liquidity at some point in the future will be catastrophic. The market is assuming that the Fed will be successful by bidding up equities and selling bonds into their decision last week. The usual equity decline and bond rally ensued this week, however rather mild so far. What if… the Fed can’t get employment to fall enough to be considered successful? What might be the ramifications? If I review the first chart of the relationship between stocks and bonds, the answer to the question might be that bonds would rally rather strongly. Debt remains a large overhang to the global economy and will be acting as a wet blanket on economic growth. As such, inflation is not likely to rear its ugly head even with the excess liquidity sloshing around the economy. The falling monetary velocity is the key to the analysis. As long as velocity continues to fall, fears of actual DEFLATION remain lurking in the economic background. The rally over the past year has come in the face of slowing economic activity and near generational highs in profit margins. IF growth does not appear, margins will no longer expand; top-line revenue growth will likely flat-line and earnings will also flatten or decline. Investors will need to ask themselves how to value companies with little growth at very low discount rates? The mathematical guess would be less than today’s prices. As a result of the rather gloomy future look, bonds once again look like a safe-haven investment until the equities better reflect the economic environment. Treasuries are somewhat expensive, but the most liquid and would be the investment of first choice, however the very clean corporate balance sheets would warrant taking a serious look at corporate bonds. What is very clear: the actions of the Fed last week have created a new set of rules and investors will need some time to figure out how to “win” under the new rules. As a result, historical relationships are severely diminished and we’ll all be left guessing as to what should be without historical reference points.